Ask The Mayor: How Can I Get Speed Bumps on Our Street? Q: How can I get speed bumps installed on my street? People are constantly speeding where I live on Kea Street. A: We get many calls/emails for speed bumps and speed tables, and I would be more than happy to help you make a formal request. 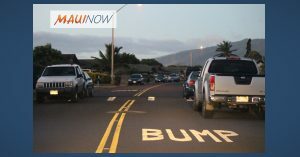 To make a speed hump information request, visit https://www.mauicounty.gov/556/Engineering-Division . Make sure to fill out the form completely, with the location for the proposed speed hump, and email it to Eng.Traffic@co.maui.hi.us . The purpose of the speed hump program is to assist neighborhoods with installations on minor streets, which generally don’t service through traffic. For more information, please call our Department of Public Works Engineering Division at 270-7745.